President Illia had been forced from office by a military coup in 1966, another victim of the revolving door of democracy & dictatorship in the 20th century. The Argentina Independent has a good article describing Illia’s last day in office. 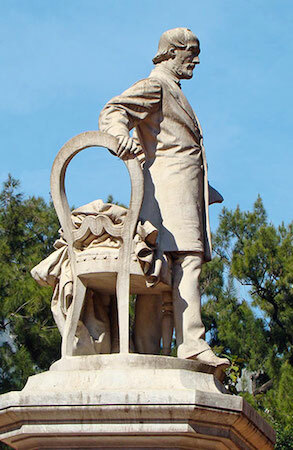 As a high-ranking member of the Unión Cívica Radical, he was entitled to be buried in a mausoleum dedicated to those who had died in the 1890 revolution: a conflict that gave birth to that political party. 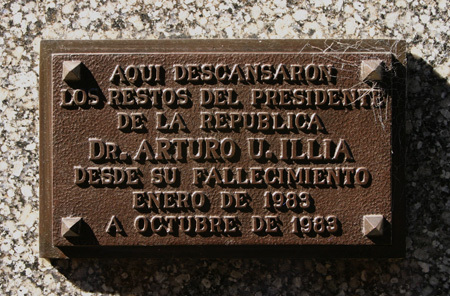 Obviously he was moved there in October 1983, but why did Illia spend 10 months in this spot? A Presidential sash inside is another reminder of his temporary stay. 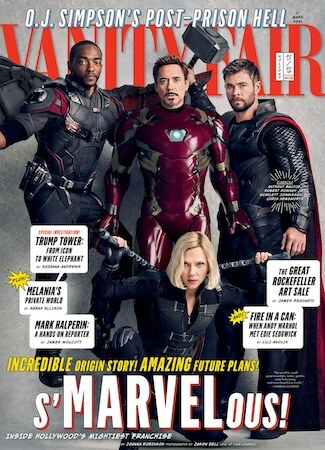 At first I thought this family might be related to Illia’s wife, Silvia Elvira Martorell Kaswalder. She had been undergoing treatment for cancer in a Texas hospital when Illia was forced from office in 1966. Silvia passed away only a few months later back home in Córdoba & was buried in Recoleta Cemetery in the tomb of Hipólito Yrigoyen’s mother. 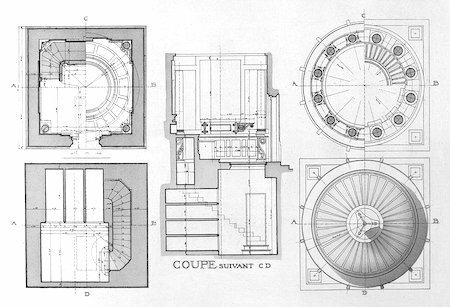 Several decades later, she moved to a separate vault. A search in Genealogía Familiar turned up nothing to relate either Illia or his wife to the Dechert-Barletti family. According to a 1977 edition of the Boletín Oficial, Jorge Luis Dechert & Ernesto Alberto Barletti formed a company called Nininco that specialized in radio & television components as well as albums & cassette tapes. The business venture no longer exists, so even that extra info was a dead end. If anyone has information as to why a former President temporarily rested in peace here, please help us solve this mystery! References to Recoleta Cemetery appear in some unexpected places, but I’ve always been surprised at the lack of academic research about its development as one of the most recognized & visited spots in Buenos Aires. 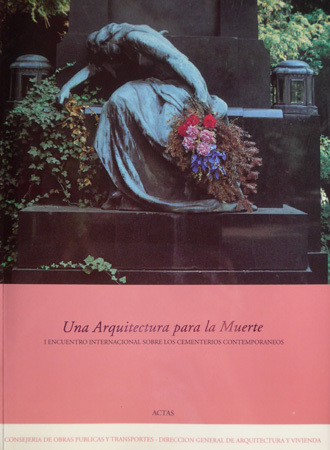 Not long ago, I obtained a copy of a book titled “Una Arquitectura para la Muerte” (An Architecture for Death) that was published in Spain after a 1991 conference about contemporary cemeteries around the world. This large book compiles all the research from that conference & first became available two years later in 1993. Funeral carriages often took a route down Calle Florida to Recoleta Cemetery so everyone could participate in mourning along the most famous street in Buenos Aires. Bodies were wrapped in sheets due to a lack of caskets during the yellow fever epidemic that gave birth to Chacarita Cemetery. The Estación Fúnebre Bermejo existed at the intersection of Calle Ecuador (formerly named Bermejo) & Avenida Corrientes to handle the transfer of the deceased by train to Chacarita, complete with offices & rooms for autopsies. A trolley line for Recoleta Cemetery began service in 1870, prior to the Lacroze line to Chacarita which commenced operation in 1888. 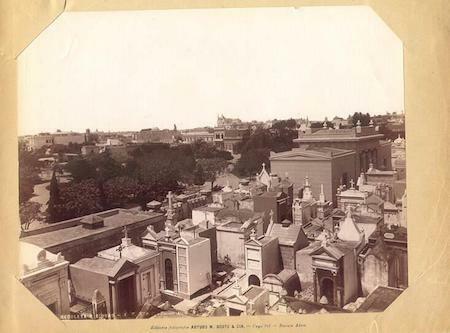 The first cremation in Buenos Aires took place due to a cholera epidemic & became a standardized procedure in 1886. 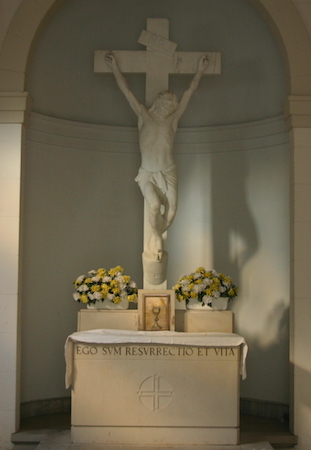 A 1923 city ordinance prohibited a public funeral service in Recoleta Cemetery with a later transfer of the deceased to another burial location. Evidently the social status of being buried in Recoleta Cemetery generated a few odd practices like this one. Home wakes continued until the early 20th century, like that of Domingo Faustino Sarmiento. They state that funeral homes didn’t really catch on until 1960! Por un lado pasa a ser una reducción simbólica de la ciudad, en segundo término es una galería donde la comunidad conserva la memoria de sus grandes hombres y, por último, es un ámbito donde desarrollar el arte. On one hand it should be a symbolic reduction of the city, in second place a gallery space where the community preserves the memory of its great men and, lastly, a place for art to develop. That happens to be the perfect response when anyone asks themselves: why would I visit a cemetery? The list of occupants of Recoleta Cemetery reads like a Who’s Who of Argentine history & society. The elite, an aspiring middle class, friends, enemies & those who contributed to the general welfare of Argentina all share space in a miniature city of mausoleums & monuments. During a visit, you’ll stroll past Presidents & politicians (some naughty, some nice), Nobel Prize winners, literary greats, entertainers, scientists, military leaders, sports figures & even some who died tragically. The cemetery’s most famous resident, Eva María Duarte de Perón—simply Evita to her devotées—even had a bizarre post-mortem journey before finally resting in peace in Recoleta. Want to learn more? 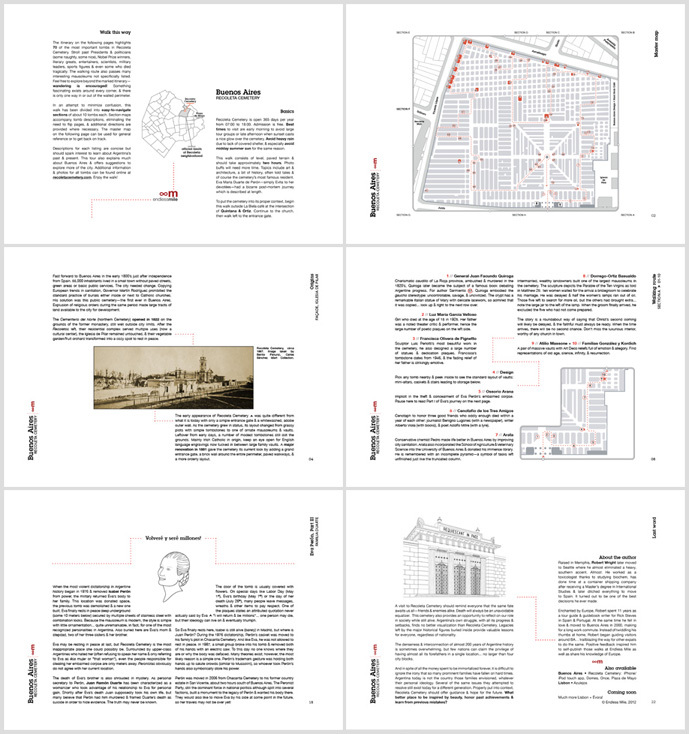 Get all the details in our highly-recommended pdf guide. 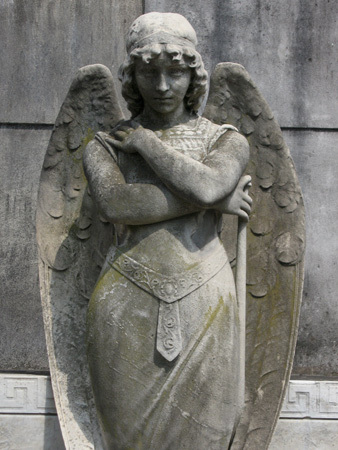 The authors of this blog are proud to have guided more than 1,500 people through Recoleta Cemetery… join in! Notice: Due to recent events, all cemeteries in Buenos Aires—Recoleta, Chacarita & Flores—will not allow visitors to enter with bags or backpacks, & handbags will be inspected by security. Directly opposite La Biela is the Recoleta cemetery, where Borges hoped to be laid alongside his parents and grandparents; in fact, he is buried in Geneva—like Graham Greene, whose favourite among his own novels, The Honorary Consul, is set in the Argentina of those years. Rather as Buenos Aires parodies its European origins—flaunting a Harrods, a Claridge’s, a Hurlingham Club and an ugly clock tower modelled on Big Ben—so is Recoleta, in V.S. Naipaul’s words, “a mimic town”. A beautiful, wounded nation seeking its identity in plagiarized dreams. That is how a walk through Recoleta’s extravagant cemetery makes me think of Argentina. Compressed into marble mausoleums the size of houses are the families who moulded and misshaped the country. Incontestably the best known is Eva Perón, the Generalissimo’s embalmed first wife, whose cult continues to flourish 65 years after her death. Poking from a grille stuffed with roses, a fresh handwritten note from the sharply diminished “Armed Forces” commends “Evita” for “standing up for social rights”. Embellished with iron roses, a grey bunker houses Argentina’s quintessential dictator, General Manuel de Rosas—“the implacable butcher”, as Borges called him—who died in exile in Southampton in 1877. A journey I never made was with Bruce Chatwin to the dairy farm where Rosas sold milk for two pence a quart, and to see his grave. 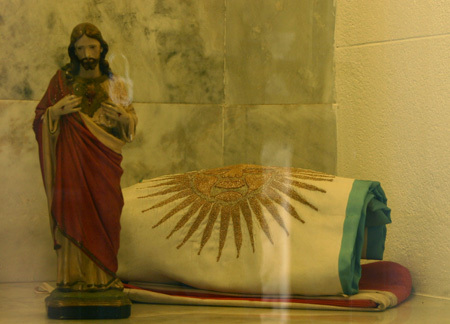 Chatwin died in the same year, 1989, that Rosas’s remains were repatriated with enormous fanfare to the Recoleta. A riderless horse draped with Rosas’s symbolic red poncho accompanied the casket, alleged by critics to contain the bones of a Blitz-blasted cow. Also in the procession were 5,000 gauchos and members of the security services dressed as members of the Mazorca, Rosas’s dreaded secret police—nicknamed the colorados, after their ponchos—although not many of the estimated two million observers lining the streets knew this. The Mazorca dumped the corpses of their victims over the walls of the Recoleta—as, in copycat style, did Isabelita’s paramilitary successors, the Ford Falcon-driving Triple A. The authors of this blog are unaware of any dumping of corpses in Recoleta Cemetery by the last military dictatorship. We’ve documented how Mario Firmenich & the Montoneros broke inside to steal the corpse of Pedro Aramburu, but even they left his abandoned casket outside the walls. A visit by Thomas Woodbine Hinchliff in 1863 mentions dumping bodies into a “dreadful hole” by the Mazorca… another claim we have been unable to confirm in Argentine sources. The idea likely comes from Jason Wilson’s compendium of literary references (Buenos Aires: A Cultural and Literary Companion, page 104), but we’ve been unable to confirm any such act. Photo by Arturo W. Boote, exact date unknown but sometime around the end of the 19th century. From the angle, this photo was likely taken from the adjacent Iglesia de Pilar, perhaps from the bell tower. 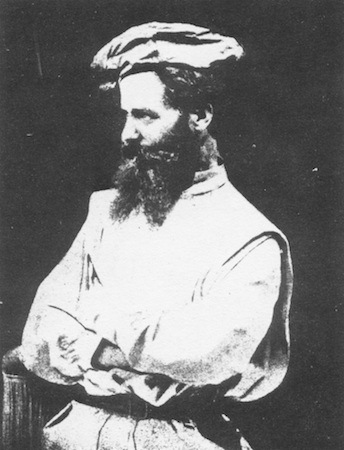 Samuel Boote (1844-1921) y Arturo Woods Boote (1861-1936) were brothers, both first generation Argentines of a large English immigrant family. Raised on ranches in the Provincia de Buenos Aires, they eventually moved to the capital & became the most famous photographers of the 1880s. A decade later they had traveled through much of Argentina, leaving a valuable photographic record for us today. By 1900 both brothers left the photography business to pursue other ventures, but at least they left a reminder of what they experienced at Recoleta Cemetery over 100 years ago.